Guadalacazar is a small farming town located an hour north of San Louis Potosi in central Mexico. The climbing consists of perfect limestone varying from bullet-hard blue vertical walls to massive stalactite-filled caves of white limestone. On first arriving into the town there is no sign of any climbing and it looks like so many small towns in central Mexico with rolling hills vacant of any rock formations. Then on further inspection you find massive caves in the centre of holes in the ground. All the caves are underground with light shining through the openings. It is a very beautiful place and climbing inside the caves is an experience on its own. The caves are filled with hundreds of swallows that are constantly zooming around and singing their mating calls to one another. At the deepest part of the cave, massive 4-metre stalactites stick out of the wall creating serpent-like shapes and you get a feeling of awe whenever you gaze upon these formations. The climbing community around Guadalacazar is very small and mostly composes of visiting climbers from San Luis Potosi who make the hour drive every weekend to come climb and enjoy the natural beauty of the caves. 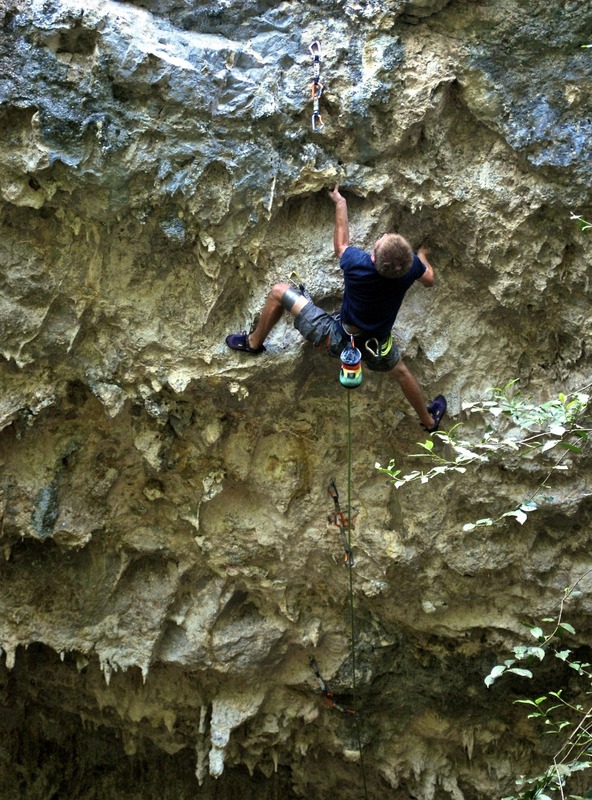 Almost all of the routes were singlehandedly put up by Christian Ehlert, a local climber from San Luis. In the past decade he has established more than seventy routes in the area and has made Guadalacazar one of the best climbing destinations in Mexico. After leaving Mexico City in search of better conditions, Alma and I contacted Christian and he welcomed us to come and stay at his house in Guadalacazar. We met up in San Luis Potosi and he took us to Guadalacazar to show us the area. Over the course of the next several days we went to several different climbing areas with some of the best rock climbing I have experienced. Each wall has its own unique style of climbing and is vastly different than the other. Our first stop was to a small cave very close to the road called Las Candelas. This small cave is the most easily accessible and holds routes from 5.10d to 5.13d with some 30-metre dead horizontal ceiling routes. We spent two days here and I was able to quickly onsight the classics: África, Oogie Boogie, and Vaacanda. These went pretty easily and I was ready to try something hard. After studying the 13+’s, I picked a route called Massai Mara. The route climbs through the whole roof starting from the left lip of the cave and ending at the lip of the roof. Psyche was high and I started up the route determined to onsight it. The first crux I read perfectly and I made it to the second crux with fresh forearms. I pulled through the long moves and made it to the 13b finish with a slight pump. By the time I reached the lip I started really feeling the pump and fought a little harder to reach the anchors with a clean onsight. This was a huge achievement for me and my training has been paying off. Five Ten climber Urs Moosmuller grew up on the blank granite slabs of the Eastern Sierras and developed a passion for runout friction and multi pitch adventures. Recently he moved to the Front Range to pursue his passion and explore the Rocky Mountains. Favorite Shoes: Anasazis, Dragon, and Team 5.10.